Woven fabrics, that warm the heart. 1. Suit and contrasting fabric coat Kenzo. 2. Jacket with technical internal fabric with combined shirt N°21. 3. Black and white mélange with belt Giambattista Valli. 4. Detachable sleeve sweater Michael Kors. 6. Jacket and skirt with lace appliqués Nina Ricci. 7. Black insert coat Tory Burch. 8. Low-cut blouse and tight skirt Sonya Rykiel. Tessuti intrecciati, che scaldano il cuore. 1. Completo e cappotto in tessuto a contrasto Kenzo. 2. Giubbotto con interno in tessuto tecnico e camicia abbinata N°21. 3. Mélange in bianco e nero con cintura Giambattista Valli. 4. Pull con maniche staccabili Michael Kors. 5. Giacca con bottoni gioiello Chanel. 6. Giacca e gonna con applicazioni di pizzo Nina Ricci. 7. Cappotto con inserti neri Tory Burch. 8. Blusa scollata e gonna aderente Sonia Rykiel. Bellissimi abiti, vederli mi fa venire voglia di tweed, ed è strano perchè non lo ho mai amato particolarmente!!! Vedere delle foto di sfilate è sempre un piacere!!! 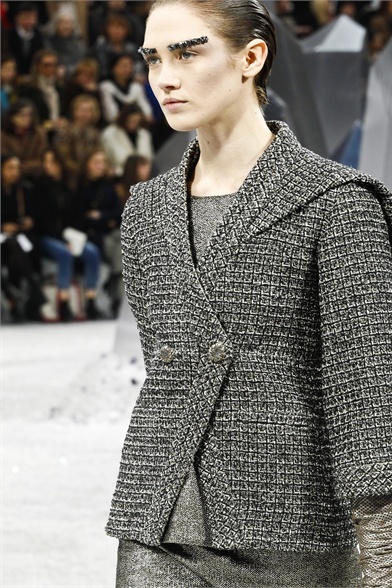 I love the texture of tweed, its timeless and elegant and makes everything seem so British chic (if that makes sense). 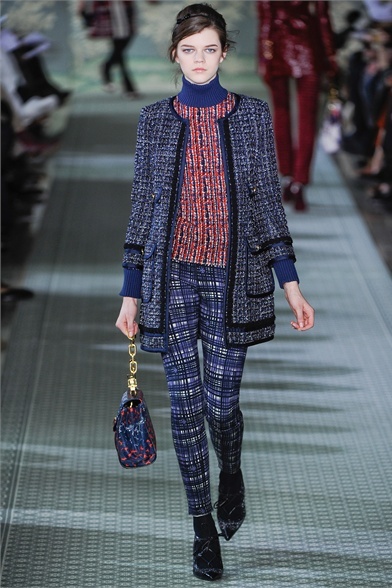 Love the way Nina Ricci used it in rich burgundy and the slick blue checkered suit. scaldano il cuore e riempono gli occhi. Thank you for your kind words....have a splendid weekend ahead! Adoro il tweed! !foto super, complimenti!